Over the last nine years I have used the B-Lines resistance bands for P90X, Body Beast, P90X2, Power 90, and for general working out in my home gym. The B-Lines resistance bands have been mistakenly called the P90X resistance bands or the Body Beast resistance bands for awhile. 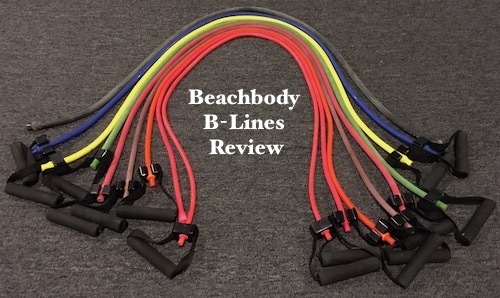 What they should be called is the Beachbody resistance bands as that is what the “B” stands for. In most cases I would use the 30 pound red band as it was enough resistance for curls. For moves like “straight arm flys” I would use the 15 pound pink band. My collection of Beachbody resistance bands. My first purchase was the “Super Kit” which includes a 40, 30, and 20 pound resistance bands. From time to time I would buy one resistance band (like the 50 pound black band) or Beachbody would send me one as result of the many Beachbody Coach contests I’ve qualified for. Memory tells me they sent me a pink (15 pound), blue (45 pound), and yellow (35 pound) resistance bands. Resistance bands are resistance bands. There is not to much to review about them. They either work or they don’t. Rarely do you hear of someone snapping a resistance band in two doing bicep curls. The B-Lines resistance bands I have bought over the years have performed just fine. Not once have they snapped in two or did not function the way they were supposed to. Saying that there is one thing we can talk about. The only bad thing about the B-Lines resistance bands is the handles. They are horrible. And I’m talking about the whole handle, not just the grip, could be better designed. 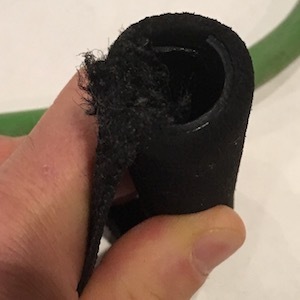 Foam grips covering a plastic handle with a nylon rope is not a good combination. My guess is I have broke two sets of handles (4 total) over the years and have another set about to go. Both are starting to fray. Look closer at the green band picture and you will see a piece of the inner plastic piece has already broke. Its just a matter of time before it cracks the entire length. This is what happened on the previous ones I broke. Resistance goes through those handles pinching the fabric against the plastic piece causing some friction. 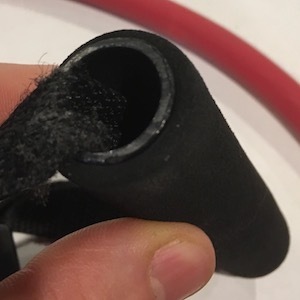 On the lighter bands it tends to be an issue with the foam splitting from the plastic piece as the picture below shows. Then there is the issue of getting the handles onto the resistance bands. The B-Lines bands are designed in such a way that the handles will work with any of the bands. Each bands end has a built in cone which is designed to slide into the bottom part of the handle locking it into place. You start with the skinnier part of the band and pull the handle into place. Unfortunately it is not that easy with the 40 to 50 pound bands. Completely inappropriate here but the amount of lube it takes to get the 50 pound black resistance band onto the handle is quite a lot. Water on its own did not work. Dish soap and a lot of finesse is what finally did the trick. Everything was great until the handle broke. Made the executive decision to never put another set of handles on the 50 pound black resistance band again. Doing pull ups in my basement is tricky to do with a low ceiling so I wrap it around a random hook I found and grip the ends mimicking a pull up. Makes it a little tougher because of the odd grip. 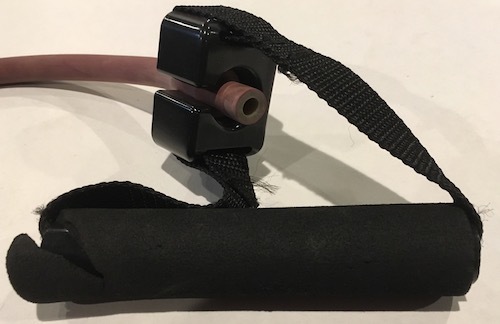 The good news about the B-Lines resistance bands handles is that they only seem to break on the heavy duty resistance bands (30 to 50 pounds). Replacement handles cost $5. This is the most extreme resistance band available. The B-Lines resistance bands do work. I’ve accumulated a number of the resistance bands over the past nine years and see myself getting many more years out of them. I do prefer using my Bowflex SelectTech Dumbbells in most workouts but from time to time I like to switch things up and will grab the resistance bands. Throw them in a suitcase when you travel, keep them near your desk at work, or in your family room near the TV and bust out some reps.
My only complaint is about the handles. Beachbody could do a better job of designing them. My suggestion would be to get rid of the plastic inside and nylon rope and use an entire rubber set up. Nothing should break then. At the very least the same handles but ones designed for 15 to 30 pounds and others for 35 to 50 pounds. If you have any questions about the Beachbody B-Lines Resistance bands fell free to leave one below.